I am a Naturopathic Life Coach and CBD Educator providing personal and business development along with support through natural products such as herbs, essential oils, and CBD. Ask Dr. Ho because you can literally ask me anything. The feature below was chosen by our Julie see her post Why Pinterest? – Why Ignoring it is Costing Your Business! 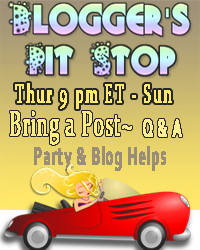 We are excited that you joined the Blogger’s Pit Stop #168. Join us on Friday 19th April 2019.